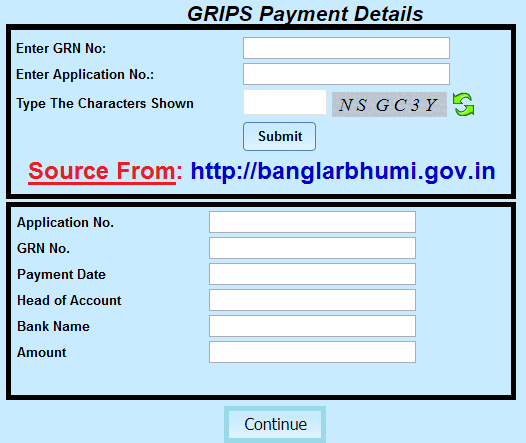 Instructions on Find the Banglarbhumi Application GRN Search [Government Reference Number] (GRIPS Payment Details) in banglarbhumi.gov.in website…. Banglarbhumi is a portal of West Bengal’s government where you can find out all land related information to people who are usually divided into various zones like Agricultural, Industrial and Tourism in West Bengal. In West Bengal, Banglar Bhumi is a portal where your land-related records are kept. This is a great platform to provide the land information for the entrepreneurs. With the help of Banglar Bhumi portal, entrepreneurs can know about the industries that they’ve intended to own. They can easily find out actual infrastructure through the Banglarbhumi.gov.in website. At Banglarbhumi website, you can easily find out all the details of Land Records as well as the Khatian Number which you’ll get along with the Plot Number. The basic idea behind providing the Banglarbhumi Portal by the Land and Land Reforms Department of West Bengal is making the appropriate zones without disturbing the food security of the state. GRN stands for Government Reference Number. To register your case and in order to verify the payment made by you, you need to make a GRN search. Actually, in the GRN status, the payment of the taxes is maintained. Actually, the GRN search is mostly made, if someone has made the payment for a particular cause, but he/she has not received a confirmation of the same by any means. To check, whether the payment has been successfully done or not, one can make a GRN search. After the payment, you can also search for Application Government Reference Number (GRN) for your Khatian / Plot. It can be easily generated in West Bengal using its official portal Banglarbhumi. Open the http://banglarbhumi.gov.in website. Once the user logon into the main website on the homepage, you will be able to see various tabs like Service Delivery, Online Application, Citizen Service etc. From them, choose the Online Application tab. Once you choose that, you will be able to see the hyperlink saying ‘Application GRN Search’. Click on that. On the new page which appears, you need to enter the GRN No. and the Application No. There will be a Captcha code too. You need to enter the characters shown correctly and then press the ‘Submit’ button. Once you do that, you will be able to see all the information like the date of payment, head of the account, the bank through which the payment is made and also the total amount paid. Once you have checked the payment details, click on the ‘Continue’ tab and you are all done. I have forgotten ROR number but I have GRN number . How can I get my ROR number ?? Answer please, Its very urgent.